The Spanish Directorate General of Merchant Marine under the Development Ministry has denied permission for the Spanish Proactiva Open Arms search and rescue vessel to conduct its mission in the central Mediterranean. The vessel, which operates between Libya and Southern Europe, docked in southern Spain on December 28 with the 311 refugees and migrants it had rescued a week earlier off the coast of Libya, after both Italy and Malta denied it entry. It had been due to set sail again on January 8 but complying with the decision from the Spanish Directorate General of Merchant Marine, Barcelona’s Port Authority prohibited it from leaving, a Proactiva Open Arms spokeswoman confirmed. 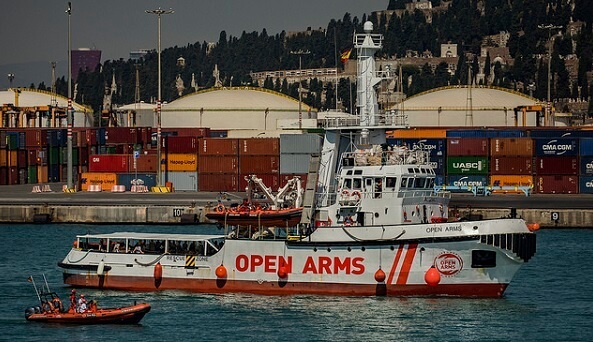 Proactiva Open Arms denounced the decision that has been applauded by Deputy Prime Minister of Italy and Minister of the Interior Matteo Salvini, as political, and appealed it requesting permission to carry out “observation and surveillance tasks in the central Mediterranean”. The Spanish Directorate General of Merchant Marine, which rejects the accusation of political motivation, stated that the fact that the vessel is forced to navigate long distances constitutes a breach of maritime law. Oscar Camps, founder of Proactiva Open Arms and owner of the boat, stated to El País: “The Open Arms must be the most audited boat in Spain, we have everything in order. If all the ships that cross the area are denied the dispatch because, if they rescue they will not be able to disembark in a nearby safe harbour, there will not be more vessels in the Mediterranean”. In June 2018, the Spanish Prime Minister allowed the Aquarius, a boat chartered by the aid groups SOS Mediterranee and Doctors Without Borders, to dock in Spain with more than 600 refugees and migrants on board but refused the vessel to dock again in August. Spain became Europe’s main entry point for migrants last year, overtaking Greece and Italy. Both countries have introduced measures to prevent rescued migrants from disembarking at their ports. More than 55,000 migrants arrived in Spain by sea in 2018, according to the UN refugee agency.